Blockchain has been evolving rapidly since the publication of “Bitcoin: A Peer-to-Peer Electronic Cash System” by Satoshi Nakamoto. Some even claim blockchain to be the next disruptive innovation for a number of traditional industries. But how applicable is this technology in reality and what impact will it have on traditional industries? Please join us for a panel discussion on this topic at the Yale Center Beijing on April 12 at 7pm. Time: 7:00 p.m. - 9:00 p.m., Check-in Begins 6:30 p.m. Ticket: RMB 20 for students; RMB 60 for Yale alumni; RMB 80 for others. Pay in advance on Yoopay. Join us in congratulating our very own Jasmine, co-founder and director of Philanthropy in Motion. To learn more about Jasmine’s work and others on the list, click here. Congratulations to Catherine Feng (MBA 09) and hubby Day Yi (JHU) for the arrival of Ava Jade Yi on February 19! Ava Jade weighed in at 6 lbs 8 ozs and spanned 19” from head to toe. She has quite a pair of lungs, dutifully keeping her parents awake at night! Catherine served as Yale Club’s Director of Speakers Series before taking up her current role as Deputy Director, Employer Engagement at the School of Management’s Career Development Office. YCB advisor and former president Alan Beebe named President of the American Chamber of Commerce in China. To read the full press release, visit AmCham China’s website (http://www.amchamchina.org). We have now received our 2015 award and want to share it with you! Thanks again for all your support. Born in Vietnam and raised in the City of Brotherly Love, I graduated from Yale in 2013 with a degree in Psychology. Having traveled throughout my infant, high school, and college years, nobody was surprised (except maybe my mother) when I picked up my bags after graduation and moved to China to work with the Yale-China Association. 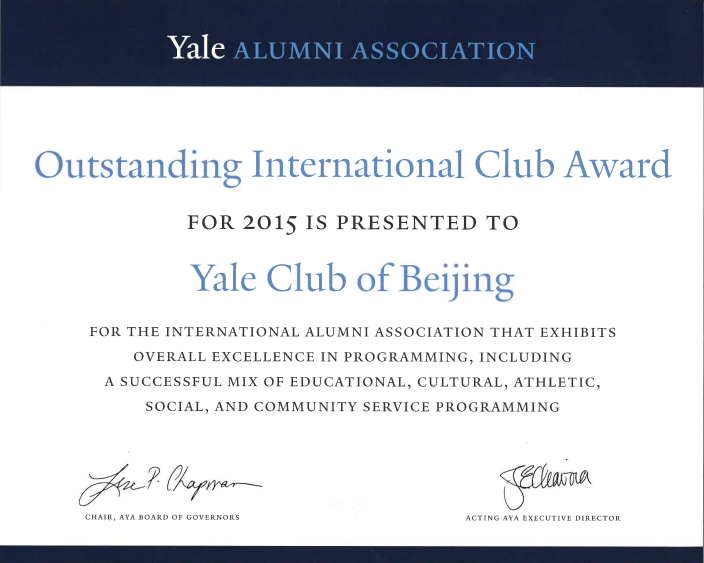 The Yale Club of Beijing (YCB or the Club) is an informal social group comprising Yale University alumni and friends. YCB is not a part of Yale University or the Association of Yale Alumni and receives no funding from outside of China. Through the years, the Club has expanded its activities from alumni gatherings to events encompassing Service, Learning and Fellowship. Yale’s Office of Undergraduate Admissions has completed its review of applications for the Class of 2019 and has offered admission to 1,963 students from 30,237 applicants, the second largest group of students to ever apply to Yale College. An additional 1,098 students were offered a place on the waitlist. Catherine Feng, SOM 09 and our Director of Speakers Series, has taken up the position of Deputy Director at Yale School of Management’s Career Development Office. We thank her for her past service to the community. While we are sorry to see her leave, we are happy that she is continuing to work with Yalies and will be visiting Beijing from time to time. (In fact, she was at the Feb Club on her first trip back to Beijing.) Potential employers, take note of this valuable contact for Yale-trained talents. If you have or know of any job openings and would like to spread the news to the whole SOM student body, Catherine would be the best person to contact. While she works for the SOM, she’d be happy to re-direct employers who are interested in students from other graduate or professional schools or undergraduate colleges. Catherine’s email is catherine.yuhui.feng@yale.edu. The Yale China Association is looking for a new Executive Director at its New Haven head office. Interested persons should follow the instructions on the job description at https://www.linkedin.com/jobs2/view/32514268.